Many areas have already been experiencing minus 40 degree with windchill but it is expected to get worse. The colder air plunging back into midwestern and northeastern United States late this week will pale in comparison to the brutal cold expected to end January as the polar vortex plunges south. "From this Thursday night through late next week, it will be a very cold stretch and high energy draw from the Plains to the East Coast," according to AccuWeather Lead Long-Range Meteorologist Paul Pastelok. While the current blast of Arctic air is expected to hold highs to the single digits and teens across most of the Midwest on Friday and Saturday, even harsher conditions can put more people and animals at risk for frostbite and hypothermia during the middle of next week. The weather services are projecting record low temperatures in Chicago breaking record of -27 of January 20, 1985. Be careful! 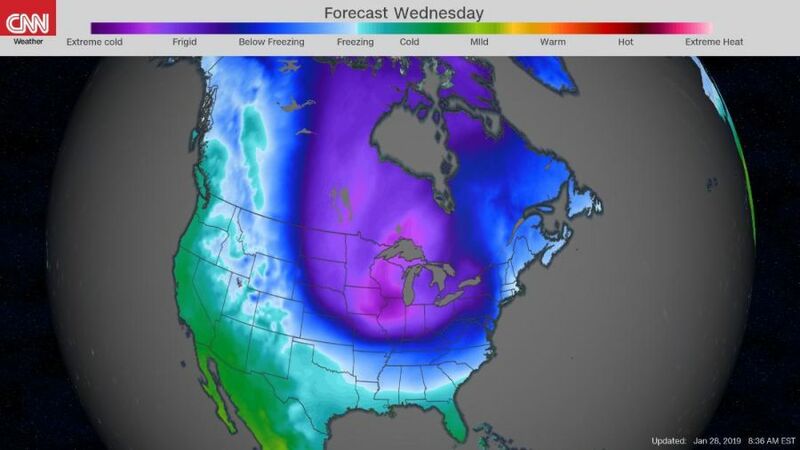 If you think the cold across the Midwest and Northeast is bad now, just wait. Over the next week there will be two cold waves impacting the eastern half of the country. The first one will bring temperatures of 15 to 20 degrees below normal across the Midwest. The second will be the one for the record books. I am not looking forward to it here in central NY state. Joe Bastardi at weatherbell.com has an entertaining way of explaining the reasoning behind his predictions. He has been very accurate about this winter so far. We have a predicted high of -10 for next week here in Wisconsin. Here it comes. If you are in zone please make sure you have blankets on hand. Many heating systems will struggle to keep up with this. Gov. Tony Evers of Wisconsin declared an emergency and told the National Guard to be ready to help. The University of Notre Dame announced it was closing its northern Indiana campus from Tuesday evening until Thursday afternoon. And in Chicago, city leaders deployed buses as mobile warming centers and offered tips on how to thaw frozen pipes (hair dryers work well, they said, but don’t use an open flame). Forecasters expect Wednesday’s high temperature (yes, the high) to be minus 14 degrees Fahrenheit in Chicago and Minneapolis. If the forecast holds, that would be Chicago’s lowest high temperature for a single day since officials began keeping records. Forecast low here in Houston, TX 36/39 tonight upward from there. Forecast high temps ranging up to 75 next Tuesday. The forecast here on the Gulf is 29 tonight. That's pretty cold by our standards, but about par for a couple of times each winter. Doesn't look like the brunt of the storm system is reaching this far south. Yeah that's pretty cold for your area. I'm not actually in Houston but about 25 miles inland from Galveston Island. Wonder why your forecast is for cooler weather than ours. Larger population and more autos and concrete here? I don't know why, Redman. Our usual winters will hit 25 once or twice with maybe a couple of other 30 degree freezes. Some years it doesn't freeze at all. The last time we got a real polar vortex dipping this far south was 2014, when it got down to 15 degrees and never above freezing for three days. That was very unusual. Maybe it is the concrete and autos over your way. I know that New Orleans, 60 miles west of here, is usually 10 degrees warmer during these temperature dips. OTOH, that may have a lot to do with Lake Pontchartrain. Somehow I got the impression you were around Corpus Christi somewhere. Could be the concrete and autos but it seems most of the fronts moving through are colder to the east of us. You are ground zero, Chicagoland! Please check on elderly. It is sad to see so many death stories. Homeless were hit hard dispite the warming centers and buses. And there have been hundred of unusual cases like this one. A FedEx worker froze to death outside an Illinois delivery hub this week as a polar vortex plunged the region into sub-zero temperatures, according to a new report. William L. Murphy, 69, was found dead at FedEx Freight in East Moline on Thursday morning, Rock Island County Coroner Brian Gustafson told local TV station WQAD. Another worker found Murphy’s body between two tractor-trailers, Capt. Darren Gault of the East Moline Police Department told the outlet. Authorities weren’t sure how long Murphy had been there before the discovery. You just dont expect this.